Two bone-tired young cowboys descend a cactus-studded slope toward an iconic western landscape of red-rock pinnacles and winding canyons. They are not so much riding their horses as being patiently borne by them. Massive storm clouds billow behind them, threatening a downpour that may arrive before the men reach their destination. This majestic 5-foot-wide painting by Mark Maggiori, titled WEST SIDE OF THE RIO GRANDE, so impressed the judges at this year’s Masters of the American West show at the Autry Museum that it received the Don B. Huntley Spirit of the West Award as the most outstanding work in cowboy subject matter. Despite the acclaim Maggiori has been earning recently, that recognition was surprising for multiple reasons: Not only was it the artist’s Autry debut, but he is also a relative newcomer to American western subjects. The 41-year-old is a Frenchman who, until a moment of revelation and a leap of faith less than five years ago, had never considered painting cowboys. Maggiori’s background may not have clearly predicted his future calling or phenomenal success. But it’s possible nonetheless to trace subtle indicators of the painter he is today. children of Robert, a philosophy professor and author, and Helen, who taught French, Latin, and Greek. Early in his school years, he enjoyed drawing at home, filling sketchbooks with pictures of robots and spaceships. His parents, however, “wanted me to have a real job,” urging him toward more academic pursuits. “But I wasn’t really good at school,” Maggiori continues, laughingly explaining that his “monomaniacal” nature led to obsessions first with playing soccer, starting at the age of 7, and then, by his mid-teens, with skateboarding. That pursuit, in turn, fostered a fascination with America, particularly the skateboarding culture of Los Angeles. Now a committed student, he stayed in art school for the full four-year course. Along the way he gained experience in animation, interning at the Paris studios of Disney, where he was involved in the 1999 film Tarzan. “I had dreadlocks at the time, and so did Tarzan, so the main animator used me as a model to see how the dreadlocks moved,” he says. Back home, he began researching the market, which included reading Southwest Art. “I realized there was a whole western art scene. I wanted to be part of it.” So, he says, “I took a big step into unknown territory.” He and Petecia moved to her mother’s house in Kingman, AZ, and, with the same kind of monomaniacal dedication he’d always shown, Maggiori began painting in a backyard shack. Seeking to jumpstart his new career, he posted his early efforts on Instagram, and his following boomed (today it exceeds 65,000). That quickly led to a connection with successful western artist Logan Maxwell Hagege, who invited Maggiori to meet at the respected Maxwell Alexander Gallery in Los Angeles, directed and owned by his brother, Beau Alexander. “I put simple wood frames on four of my paintings, loaded them in my car, and drove from Kingman to LA,” Maggiori remembers. “Logan and Beau welcomed me, we talked, and Beau put my paintings on the wall for 10 minutes.” And then, to Maggiori’s astonishment, Alexander bought all four works. “Soon after that,” he adds, “I heard that Bruno Mars had bought one of those paintings.” Another top western gallery, Gerald Peters Gallery in Santa Fe, signed him on a few months later. 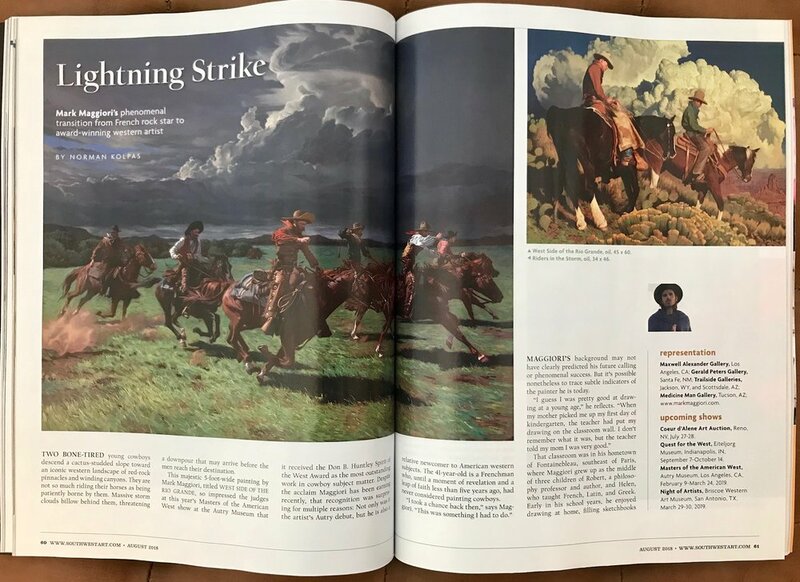 By October 2015, a painting by Maggiori landed on the cover of Southwest Art. His successes continued mounting quickly: the Patron’s Choice Award in his first big event, the 2016 Night of Artists show at the Briscoe Western Art Museum in San Antonio; the Sam Houston Award for Painting at the same show the following year; and now, this year, his major recognition at the Autry. These days Maggiori immerses himself in a field and subject matter that feel as if they’ve chosen him. While painting, he incessantly listens to audiobooks about the West. “I’m actually catching up big-time with American history, and the more I listen, the more I get ideas,” he says. Meanwhile, he continues to travel the West, gathering landscape photos and often meeting up with other artists for organized photo sessions with Indians wearing authentic garb. For more work by Mark Maggiori, click here.